Ants are social insects that typically live in colonies, made up of workers and a queen. 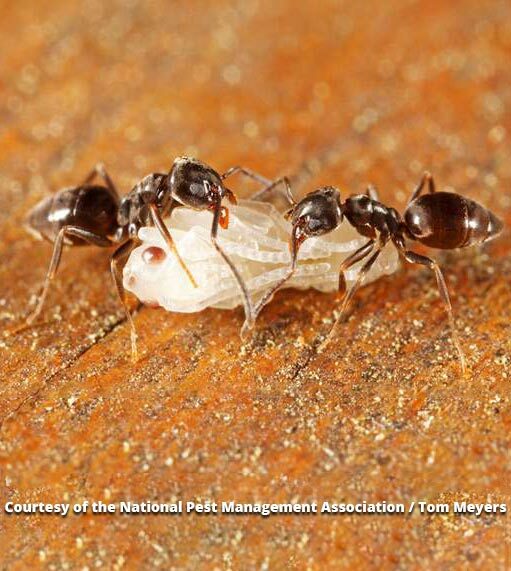 Ants will eat practically any kind of food, but are especially attracted to sweets. Ant identification is relatively simple due to their three distinct body regions: head, thorax and abdomen, as well as antennae. 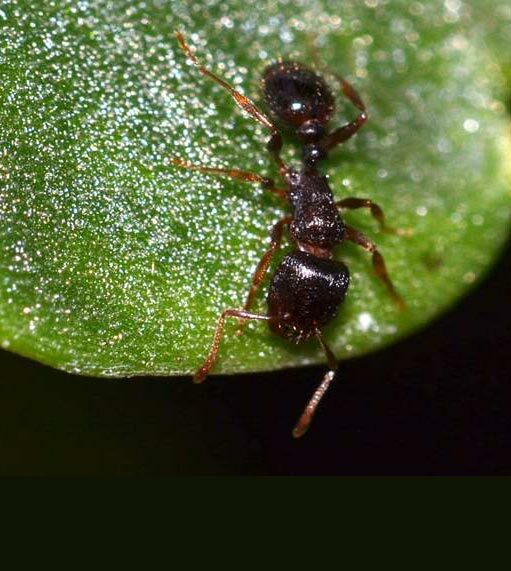 Despite similar construction, ants vary in overall appearance. Small or large ants and brown or black ants are common nicknames for different species. Most ants are drawn to moisture so it is imperative to eliminate standing water around your house. Keep tree branches and other plants cut back from the house. Store fire wood at least 20 feet away from the house and out of contact with the ground. Carpenter ants get their name from the fact that they nest primarily in wood. They do not consume wood, but rather excavate it in order to make room for their colonies. This involves excavating smooth parallel tunnels, called galleries, with the grain of the wood, including holes between galleries, called widows. Over time, this activity can weaken or destroy the structural integrity of the wood. 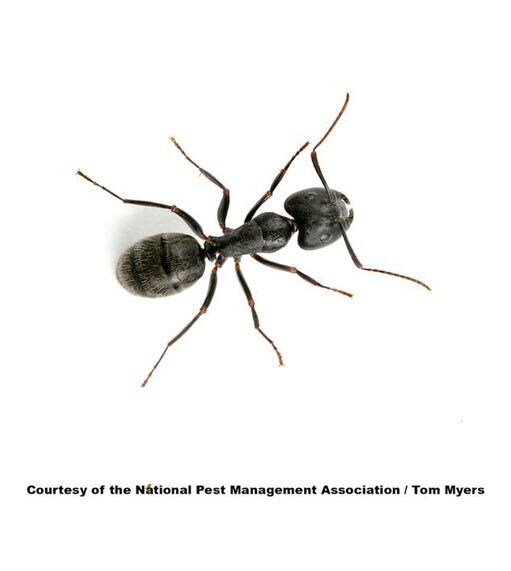 Carpenter Ants vary in length from 1/8 inch to 1/2 inch (3-10mm). There are twelve species of carpenter ants native to the Pacific Northwest, six or seven of which commonly infest homes and other structures. They are either all or mostly black in color. However, their mid-section or thorax can range in color from various shades of red to black. Western Black Carpenter Ant (Camponotus Modoc) colonies consist of anywhere from less than 100 to more than 20,000 workers, occasionally 50,000. There is usually only one functional queen per colony. Swarmers, or winged ants are not produced until a colony is at least several years old. They are produced during Summer and stay with their colonies over the following Winter, until it is time for them to swarm and mate in the Spring. Swarms can occur as early as April and as late as June at lower elevations and as late as July at higher elevations. The Odorous House Ant is the most commonly encountered species of ant which infest structures in the Pacific Northwest. They are usually approximately 1/8 inch (3mm) in length and are black or dark brown in color. Their colonies can be numerous throughout a structure as well as outdoors, especially in areas adjacent to a structure. Odorous house ant colonies commonly have multiple queens. Odorous house ants are especially fond of sweets, upon which they forage most of the time. An exception to this is when they are rearing larvae, known as brood, in which case they will forage on protein sources such as pet foods and grease. Odorous house ants are known to move their colonies in response to almost any form of stress or adverse change in conditions. These factors include weather, chemical treatment with repellant pesticides, construction or gardening or landscaping activity. Indoors, odorous house ants nest near moisture sources, such as in wall voids adjacent to plumbing, showers or other plumbing fixtures. During cold weather they will nest adjacent to warm areas which also offer some moisture. Outdoors, odorous house ants are commonly found in exposed soil, underneath rocks, stacks of firewood, mulch or in cracks and expansion joints in concrete slab-covered areas. Odorous house ants do not pose a significant public health risk. However, they can contaminate food and should not be tolerated in the home. Pavement Ants are dark red to black in color, are approximately 1/8 inch (3 mm) in length and will consume almost anything. They are primarily protein feeders, most commonly consuming meat, pet foods, cheeses or even grease left over from cooking. As such, the areas in which they most commonly forage will be in kitchen and bathroom areas. Their foraging trails can extend for 30 feet or more and are known to climb walls to enter structures. Pavement Ant colonies are primarily located in the ground and can have multiple queens. In structures, they will most commonly be found nesting underneath concrete slab floors, such as in basements and garages or underneath driveways and patios out doors. Pavement Ants are also known to nest in crawlspaces or in masonry and stucco walls. Pavement Ants are most active in Spring and Summer outdoors, but can be active indoors anytime of year. They are most noticeable when their swarmers (winged ants) prepare to swarm and mate in late Spring or early Summer. Pavement Ants do not pose a significant public health risk. However, they can contaminate food and should not be tolerated in the home.